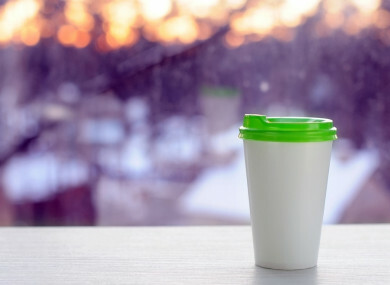 GIVING PEOPLE A financial incentive to carry their own coffee cup could dramatically reduce the number of non-compostable cups being used. Environmental scientist and broadcaster Dr Tara Shine, who spoke at a Repak (a not-for-profit recycling company which helps businesses) event this week, said those in the industry and government have a responsibility to promote recycling. “Why can’t we reward people who use their own coffee cup, say by reducing the price of their coffee by 20 cent – that would be massive,” said Shine, who argued that the big coffee chains need to lead the way on such an initiative. “If one of the big chains did it, the others would follow,” she said, adding that it would be great if all coffee shops rolled out the policy at the same time. “We learned a lot from the plastic bag tax. At the time, people questioned if it would work or if it would have an impact. It worked. Now, we all carry a reusable shopping bag with us or keep them in the boot of our cars. Small economic penalties work,” she said. Environment Minister Denis Naughten said he has spoken with coffee retailer Insomnia and fast-food restaurant Supermacs about reducing the use of disposable coffee cups in a bid to cut down on waste. It is understood that Insomnia uses 15 million cups each year and is carrying out research into biodegradable cups. Shine said she believes their needs to be an attitudinal change among consumers too. “I think it will have to become socially unacceptable to walk around with a coffee cup. At the moment it is cool to be seen with a coffee cup or plastic water bottle,” she said. With the impending roll out of pay-by-weight bin charges, customers are going to have to be more aware about what they can put in their brown recycle bin, but Shine admits she too can be confused about “what you can recycle and what you can’t” when it comes to green bins in Ireland. She said a simple, easily understood, message from all in industry would help people comply with waste regulations. “I think most people really support recycling, but seven out of ten people put items in the wrong bin,” she said. It would be beneficial if industry heads came together to roll out standardised guidelines regarding the recycling of waste, Shine argued. “If there were uniform guidelines it would make it a lot easier for people to recycle,” she added. In addition, she said companies need to stop producing products that are packaged in unnecessary plastics. “There needs to be less packaging – the industry need to change – apples do not need to be on a polystyrene trays, wrapped in plastic,” she explained, adding that there are now new plastics available that are compostable. Naughten said he is investigating how to reduce packaging at source so customers don’t bring it home in the first place, announcing that he would like large bins outside all supermarkets so that customers can dispose of their unwanted packaging before going home. However, Shine said more needs to be done to stop the production of additional plastics, not just by aiding the disposal of it at supermarkets, but encouraging companies to stop producing it in the first place. “We still don’t understand the impact plastics will have on people’s health in the future,” she said, adding that she believes it won’t really become a top priority for those in power until it becomes a public health matter. “We don’t know how bad it is yet, plastics are ending up in fish or in the land,” which humans are consuming, she explained. Shine said she would like to see a change of thinking, giving the example of someone buying an ice-cream. “Eating your ice-cream takes four minutes, but it could take nearly 600 years for the plastic cup it is in to break down – it just doesn’t make sense,” said Shine. Email “Recycling expert says those who carry their own cup should get 20c off their coffee”. Feedback on “Recycling expert says those who carry their own cup should get 20c off their coffee”.